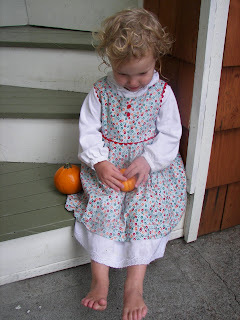 The Value Of Cheerfulness: Remember this cute little sun dress? 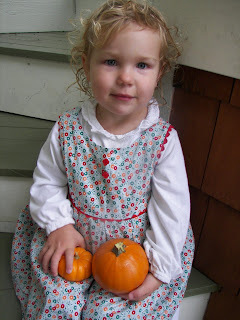 Remember this cute little sun dress? And this too sweet for words pinafore? They were made by a lovely and talented friend of mine. Who also happens to have her very own, very lovely little shop on Etsy. Need something done up in a particular size? She does custom orders. :) And I can vouch for the finished product....lovely, lovely, lovely. As easy as it would be to keep her all to myself, I really can't help but brag on her and the beautiful things she creates...after all the rest of the world deserves to discover her too. I love you Nan. And I can hardly wait to see that little Christmas dress you are sewing up for Annabelle. I am quite certain it is going to be sweet beyond compare. What a lovely talent she has! Such sweet little outfits! So pretty, just like the little girl wearing them! your child is ridiculously cute.